The color blue is often associated with calmness, which is one of the reasons it works so well to create beautiful blue kitchens. 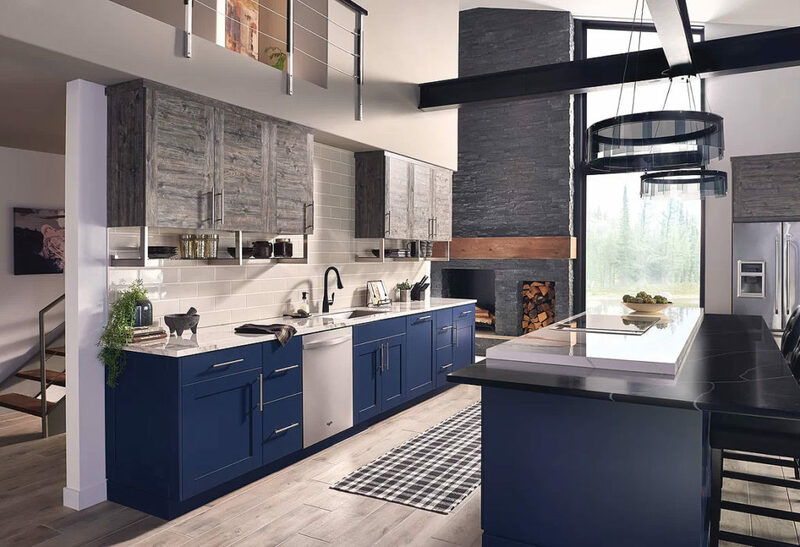 Here, we present a collection of Beautiful Blue Kitchens to inspire some ideas on how to incorporate the calming energy of the color blue into your kitchen decor. The color blue, depending on its hue, can evoke feelings of calm, energy, or freshness. It also represents a sense of strength & dependability. 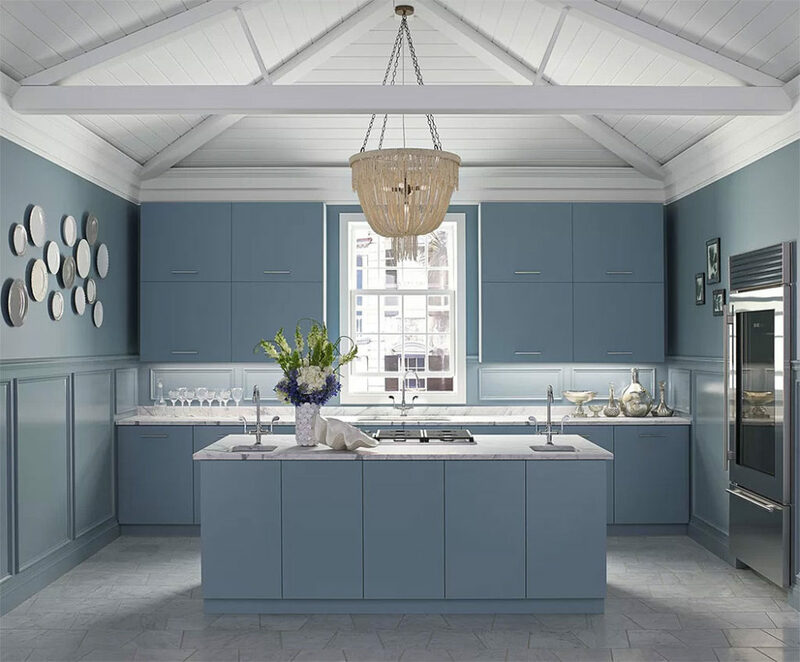 An elemental color (think of blue skies and oceans), part of the beauty of blue kitchens is the color’s amazing versatility. 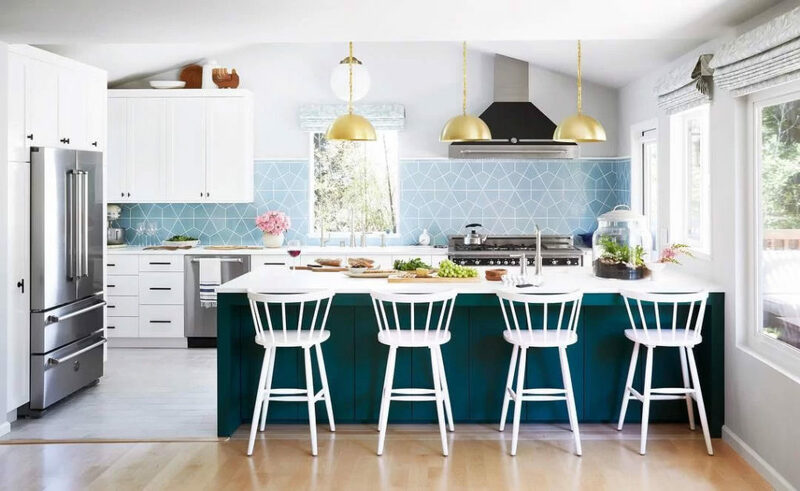 According to the color experts at HGTV, a high-energy shade of blue, such as sapphire, will a bold punch of energy to a kitchen, whereas a lighter shade of blue, such as a sky blue kitchen walls, can make a kitchen feel calming & tranquil. 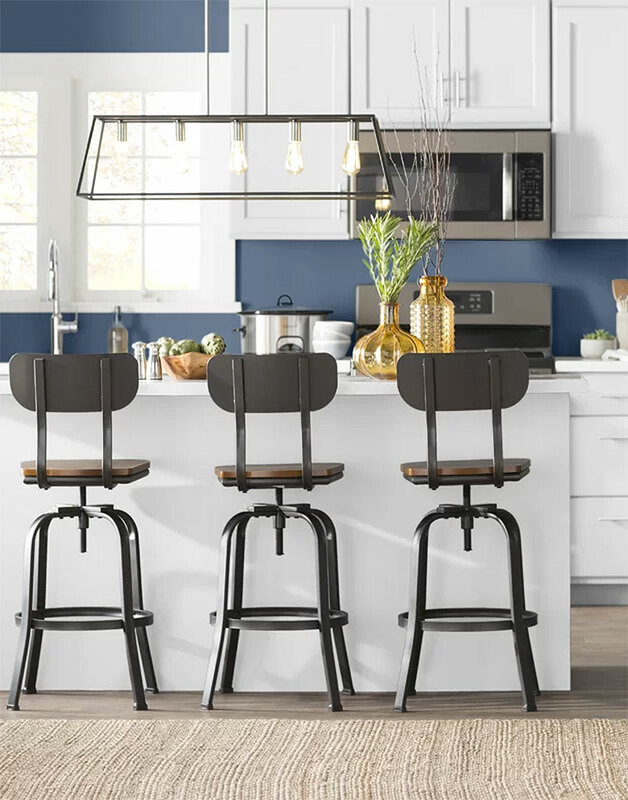 Blue can also impact the overall feel of a kitchen, with darker shades including navy blue adding a feeling of drama, while paler shades will help a small space feel bigger. 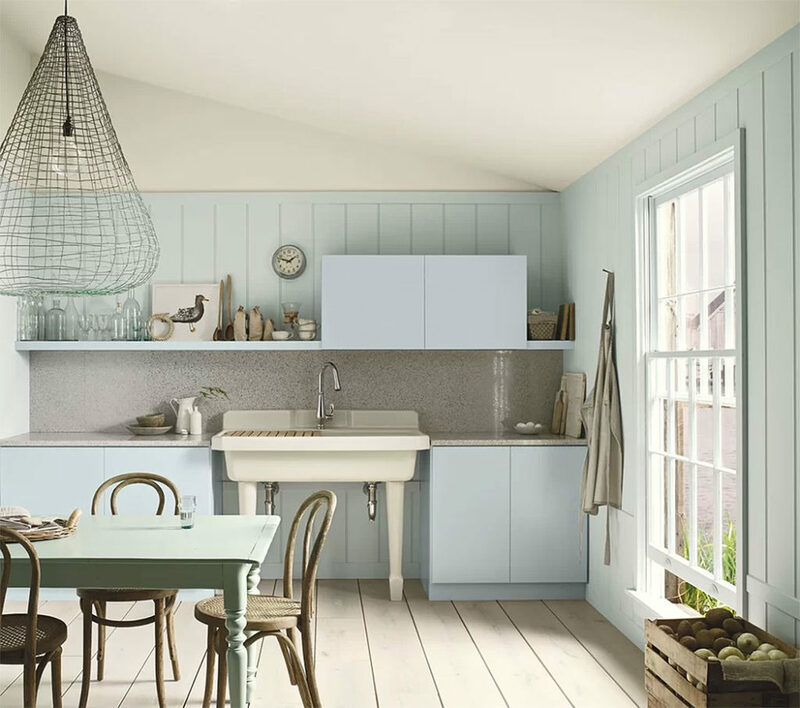 Here are some examples of some Beautiful Blue Kitchens We Love. 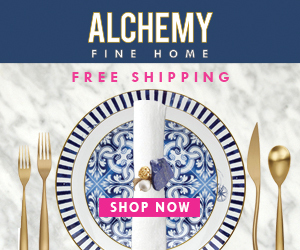 Follow the Shop the Look links to see more details at our affiliated retailer websites. 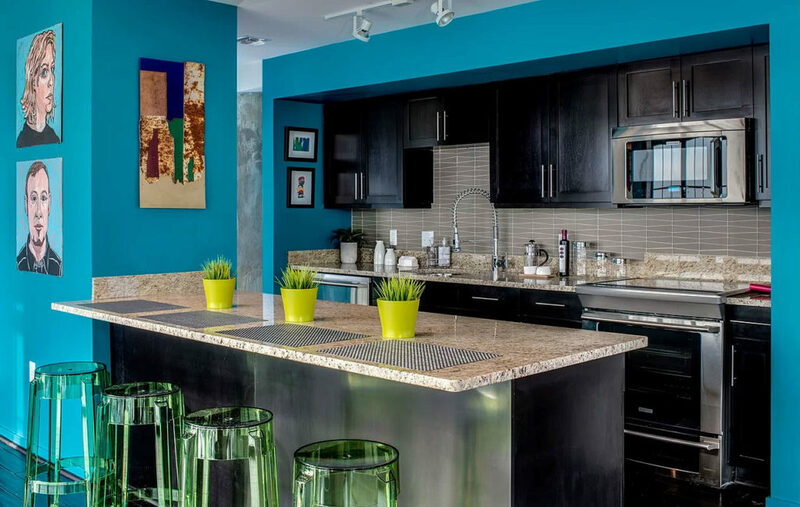 This kitchen uses vibrant blue hues offset by pops of yellow & green against a black and stainless steel background to create a modern kitchen with a pop art infusion. Dramatic Navy Blue lower cabinets create a wonderful contrast against the rustic gray of the upper cabinets and the exposed brick of the fireplace. A sleek but refined look. 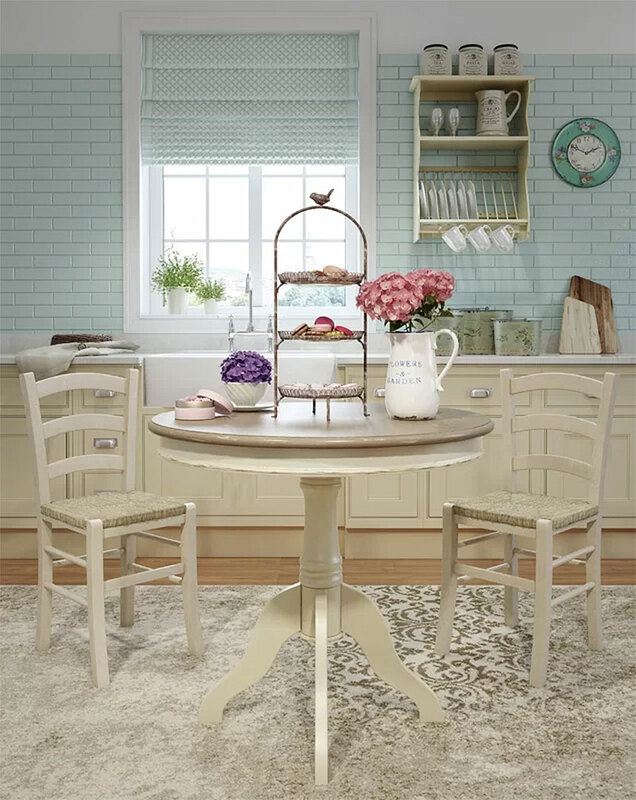 Rich, traditional French Country cream furniture and cabinetry are offset beautifully by the pale blue of the brick backsplash and matching curtains. The end results is a warm and tranquil look that invites guests to spend time relaxing in this cozy French Country kitchen. 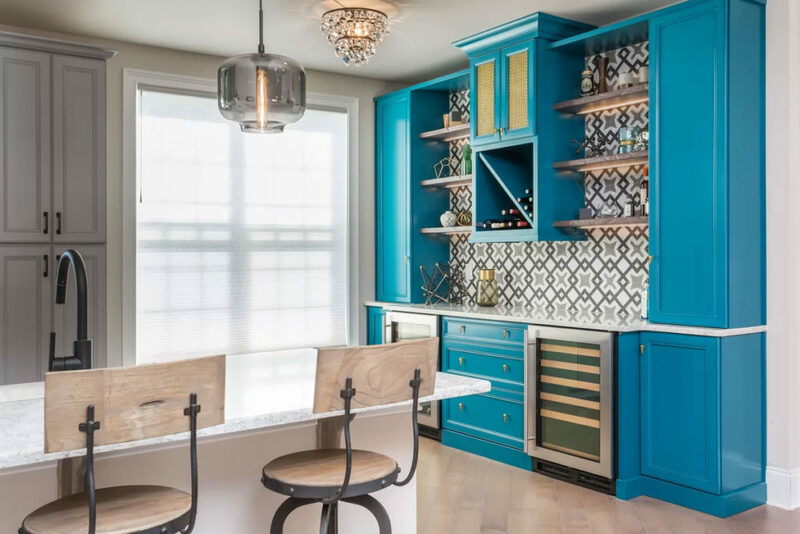 Although not a full kitchen, this rich and wonderful kitchenette features a blue tile backsplash behind the center shelves that perfectly compliments the blue walls. I also love the contrasting dark gray of the cabinetry that fades into the gray mountain scene on the wall behind the counters. There isn’t much room for cooking in this Kitchenette, but it’s perfect for entertaining! The vaulted ceilings, crystal chandelier, and coastal blue walls give this city kitchen the delightful feeling of being seaside. 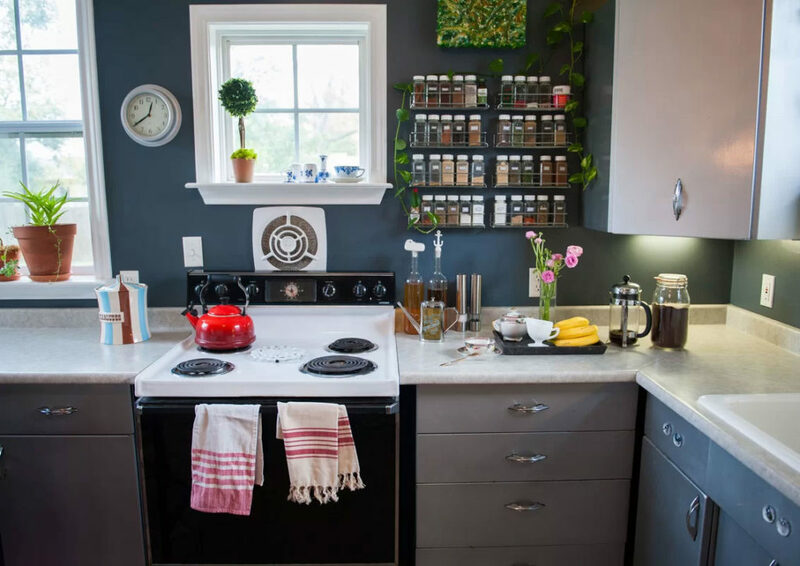 A simple paint job helps transform this mid-century bungalow’s kitchen. 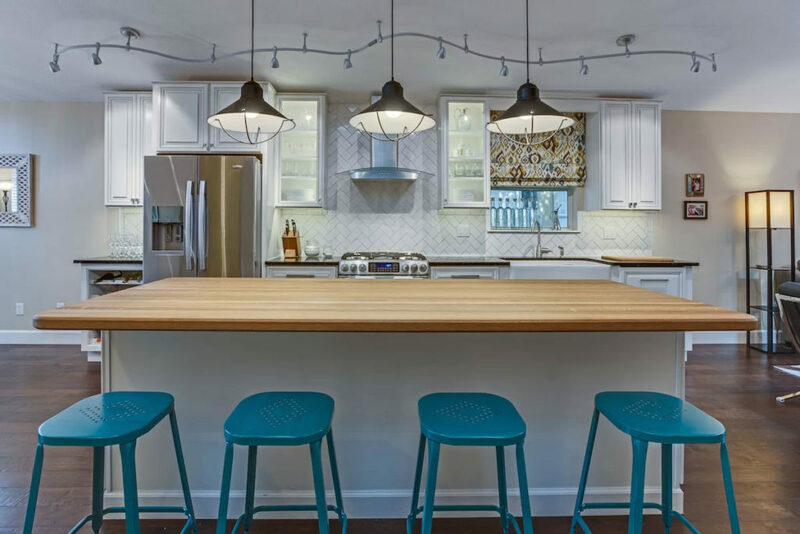 A contrasting blue backsplash and one set of lower cabinets are painted blue to create visual impact against the neutral grays of the counters and cabinets. A simple, yet effective, touch of dark blue as the the painted backsplash helps create contrast and drama in this otherwise white kitchen. A delightfully fresh and modern looking kitchen with two tones of blue used to create drama and impact against a mostly white kitchen. This sleek, industrial kitchen has a bit of a Scandinavian feel thanks to the natural wood plank floors and the bright blue island and kitchen cabinets. 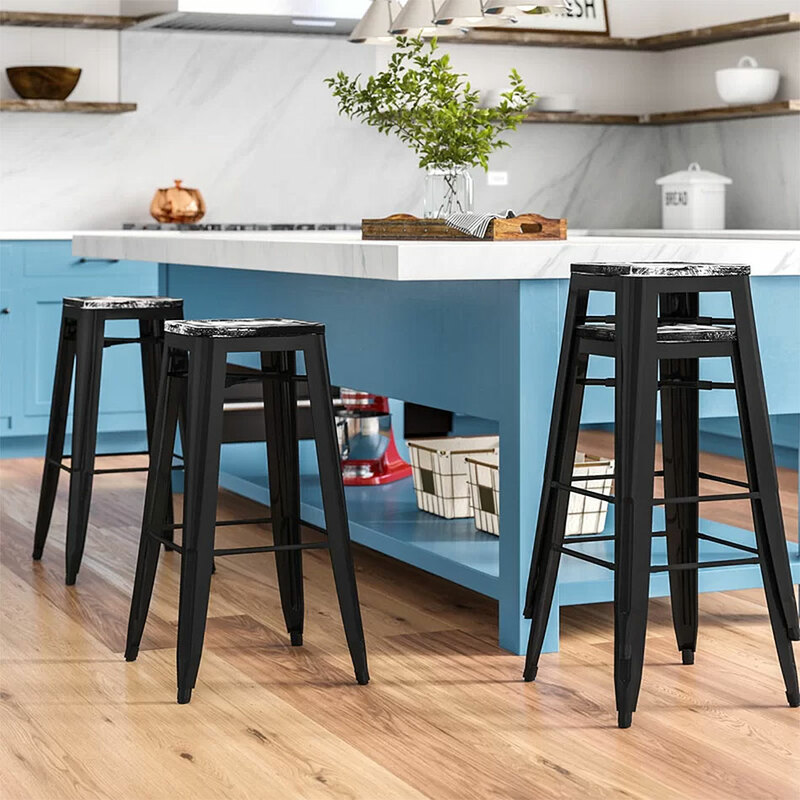 A subtle hint of blue-gray in the blacksplash is accented by rich blue stools at the kitchen island, proving that you only need a small pop of blue in a kitchen to make a big impact. 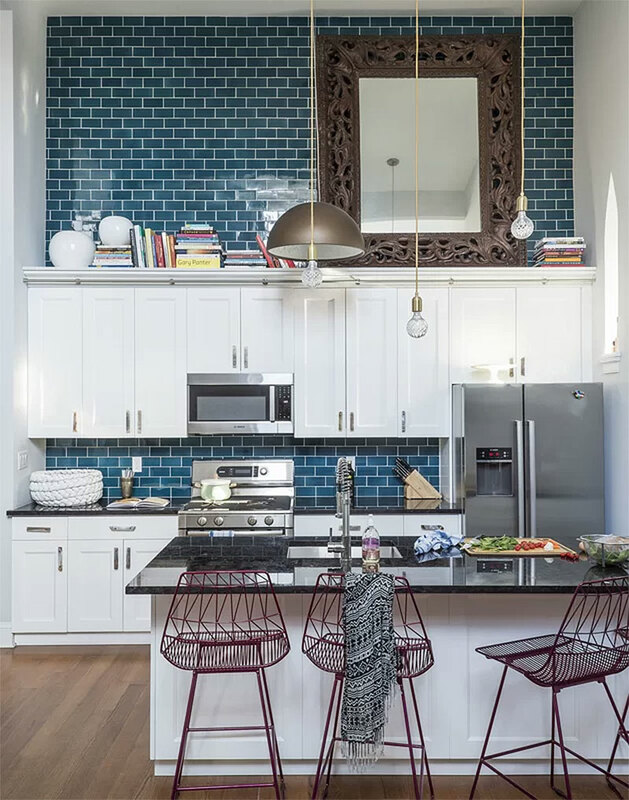 Glass Mosaic Subway tile in dark blue creates a functional backsplash as well as a focal wall above the cabinets, accentuating the high ceilings in this blue kitchen. 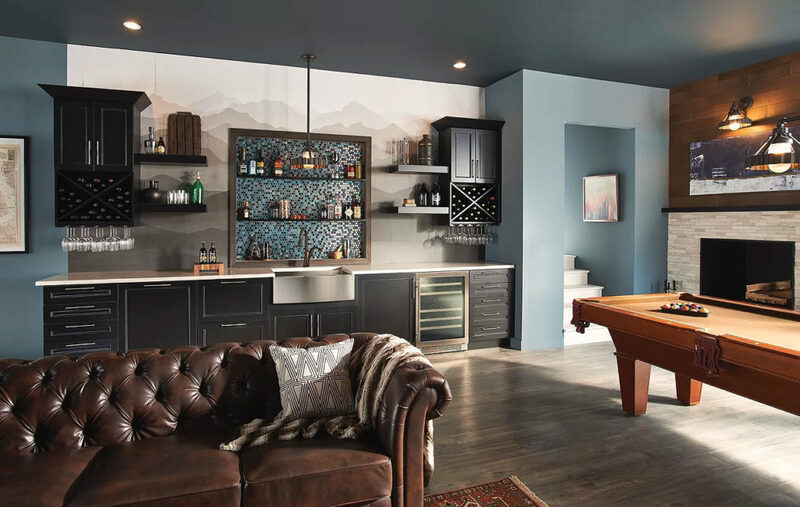 Although I love the sleek counter chairs, I probably would have gone for a set in a matching blue color to coordinate with the focal wall. Vibrant blue cabinetry creates a delightful focal point in this otherwise neutral kitchen. 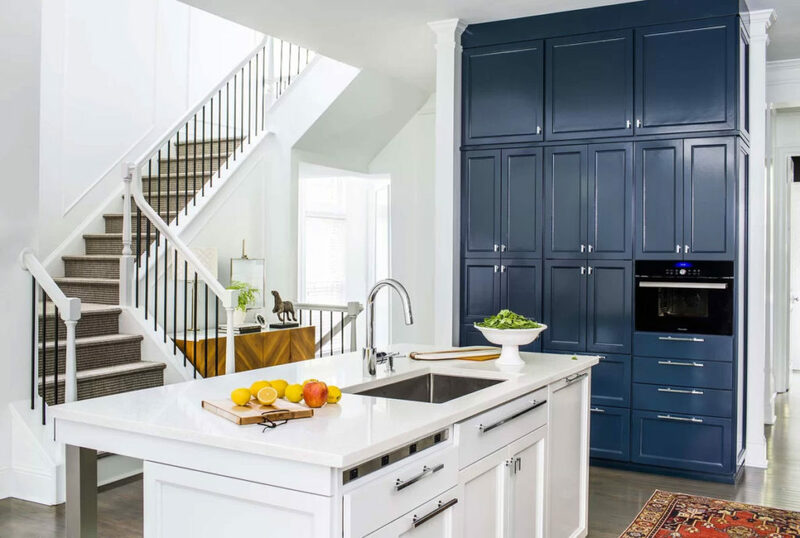 Another example of creating a focal wall using blue cabinetry, this stark white kitchen gets a pop of color with a dark blue set of cabinets that provide a wonderful and colorful contrast in this contemporary kitchen. A very soft, coastal-inspired mix of blue & blue-green washes across the walls and the cabinets in this coastal cottage blue kitchen. 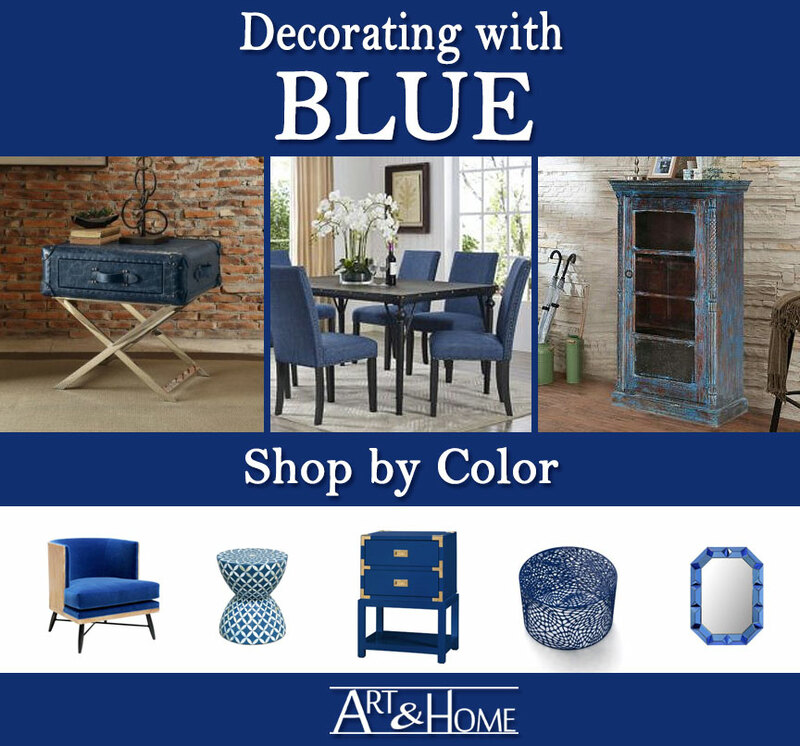 Looking for More Blue Furniture & Decor Ideas?